A company typically records a sale (i.e., includes it in their income statement) when it delivers a product or service to a customer. Although that sounds simple, putting it into practice can be quite complex. The issue of “when is a sale a sale” is one of the more artful aspects of finance. If you look in any public company’s 10-K (reported financial information), you’ll likely find pages dedicated to how the company recognizes revenue. 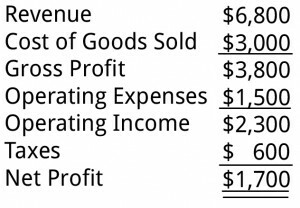 Revenue is the top line on this sample income statement, shown in thousands. Your company sells to retailers. Using a practice known as bill-and-hold, you allow your customers to buy product (like a popular Christmas item) well in advance of the time they will actually need it. You warehouse it for them and ship it out later. When have you earned the revenue? You work for an architectural firm. The firm provides clients with plans for buildings, deals with the local building authorities, and supervises the construction or reconstruction. All these services are included in the firm’s fee, which is generally figured as a percentage of construction costs. 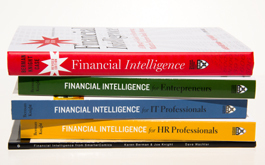 How do you determine when the firm has earned its revenue? Each company will differ one from another and that’s the point. There are no hard-and-fast answers on when to recognize revenue. The pressure for manipulation can be intense. Let’s take a software company, for example. And let’s say that it sells software along with maintenance-and-upgrade contracts extending over a period of five years. So it has to make a judgment about when to recognize revenue from a sale. Now suppose this software company is actually a division of a large corporation, one that makes earnings predictions to Wall Street. The folks in the corporate office want to keep Wall Street happy. This quarter, alas, it looks as if the parent company is going to miss its earnings per share estimate by one penny. If it does, Wall Street will not be happy. And when Wall Street isn’t happy, the company’s stock gets hammered. Aha! (You hear the folks in the corporate office thinking.) Here is this software division. Suppose we change how its revenue is recognized? Suppose we recognize 75 percent up front instead of 50 percent? The logic might be that a sale in this business takes a lot of initial work, so they should recognize the cost and effort of making the sale as well as the cost of providing the product and delivering the service. Make the change – recognize the extra revenue – and suddenly earnings per share are nudged up to where Wall Street expects them to be. Interestingly, such as change is not illegal. An explanation might appear in the footnote to the financial statements, but then again it might not. In principle, any accounting change that is “material” to the bottom line should be footnoted in this manner.